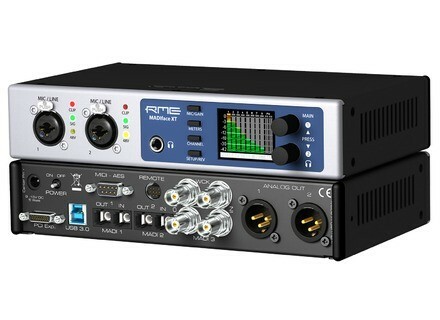 MADIface XT, USB audio interface from RME Audio. REM announces the availability in authorized stores of its new MADIface XT USB 3.0 audio interface, that had been introduced at Musikmesse. First USB 3.0 audio interface (but USB 2.0 retro-compatible), the MADIface XT can handle up to 196 inputs and 198 outputs via 2 optical MADI I/O, 1 coaxial MADI I/O, 2 mic/line analog inputs (XLR/TRS), 4 analog outputs (XLR and headphones), one AES/EBU digital I/O (via breakout cable), 1 MIDI port (via breakout cable), and 3 MIDI virtual ports via the 3 MADI ports. Each MADI input/output supports up to 64 channels and a BNC Word Clock port is also available. The sampling rate is 192kHz. The RME MADIface XT is equipped with a color screen to display the interface mode, MADI and AES input sync and MIDI input/output data. On each side of the display are 4 navigation dials and 2 encoders for output volume control. The interface ships with the TotalMix software and can be used with the option Advanced Control Remote. Full details about the MADIface XT are available at www.rme-audio.de. Soundiron launches a Tenor vocal library Following The Soprano, the Voice of Rapture series of solo operatic vocal libraries welcomes The Tenor. De la Mancha Truc2 is now free De la Mancha keeps on “letting” its plug-ins go for free, today their new freeware is Truc2. Get Alchemy at half price in December Camel Audio divides by two the price of its Alchemy virtual synth, lowers the price of some bundles and offers a didgeridoo in December.